There is no need to book late ski deals to get your winter sports fix: outdoor ice-skating is a classic NY winter activity. The rink in Central Park is well-known, and when there is snow on the ground, the park forms a stunning natural backdrop. For something with a more urban feel, head to the Rockefeller center to skate under the shadow of the gold statue of Prometheus and the city's looming skyline. 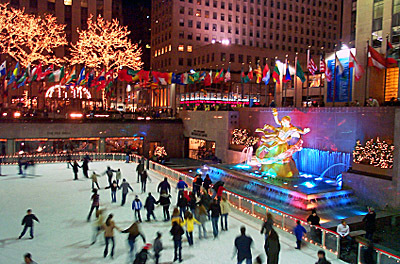 Or go for free skating in Bryant Park, where you can check out a holiday market too. Some of Europe's glitterati routinely go Christmas shopping in New York. The city's shopping district just comes into its own at this time of year, kicking off with the post-Thanksgiving Black Friday sales. Fifth Avenue in the holiday season is a joy, with its brightly-lit window displays helping to get even the most Scrooge-like of shoppers into the Christmas spirit. Visitors from Europe looking for Christmas gifts at lower prices than they're used to back home won't be disappointed by our shopping scene. Big name fashion, beauty and electrical products can be half what they are in Europe: perfect if you want to impress with your gift-buying prowess. Theater lovers will be impressed with Broadway at any time of year, of course, but this time of year brings a host of seasonal Christmas shows. Music and laughter are the order of the day and will help banish anyone's winter blues. For something really special, and quintessentially New York, head to the New York City Music Hall for their annual Christmas Spectacular. With 140 performers offering a combination of music and dance, and has become one of the highlights of the season for many New Yorkers. Or for something classic, see the New York Ballet in their annual performance of the Nutcracker at the Lincoln Center. New York has plenty of bars, from the cavernous to the intimate, in which to keep the chill out this winter. For hip, exclusive bars with plenty of style and attitude, head to East Village. Try the cute, hidden away cocktail bar Please Don't Tell (though you'll have to find it first). Or go for the other end of the scale and hit the city's dive bars for a taste of the real city underneath the glitz. If you're unsure of your bearings, you'll find plenty of companies offering organized crawls. They can be a good way to discover places you might not have found alone. New York is famous for its fantastic food, and has restaurants to suit everyone and every budget. Just choose your cuisine and dive in to a warming plate of something. Head to Chinatown for cheap but very tasty Asian food. Tuck into tasty pastrami or corned-beef hash as it should be made in one of Manhattan's famous delis. Or go upscale for a real treat: how about the Sea Grill at the Rockefeller Center for the best seafood in town, or if you really have cash to splash, Le Bernardin for divine French food. In all the glamor and hustle of the big city, a carol service can be the perfect way to sit back and experience something that is a world away from the busy streets. Grace Church on Broadway for example not only runs a series of carol services over the holiday period, but is a wonderful Gothic revival building which is a little bit of New York City history in itself. Worth visiting even when there aren't any carols to sing. These are just a few of the many things that you can in New York before Christmas this winter. If you aren't looking to spend money, be sure to check out our list of free things to do in New York City during the winter. This entry was posted on Tuesday, November 29th, 2011 at 10:48 am	and is filed under Stuff to Do. You can follow any responses to this entry through the RSS 2.0 feed. You can leave a response, or trackback from your own site.